British featherweight champion Ryan Walsh is targeting another family first with his twin brother Liam, holder of the British super-featherweight title. Ryan's split decision win over Hull's Samir Mouneimne at Wembley on Saturday marked the first occasion twins have held British titles at the same time. The Cromer-based 29-year-old said: "We've made history, let's make another bit of history - two twins defending the title on the same night in Norwich. "The crowd are second to none." Unbeaten southpaw Liam Walsh beat Gary Sykes in November last year to unite the Commonwealth and British belts. He defended his title with victory over Joe Murray in London in February and then added the vacant WBO Inter-Continental lightweight title with a sixth-round knockout against Brazil's Isaias Santos Sampaio in Manchester in July. 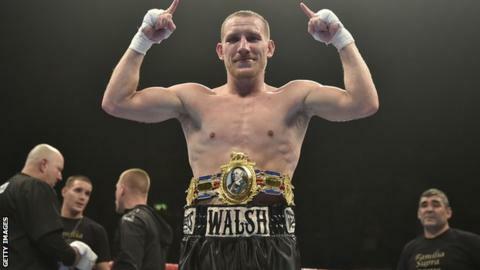 Walsh was due to fight Russia's Petr Petrov in a WBO final eliminator in Manchester next month but suffered a broken hand and has had to undergo surgery. "How good would it be to have two British champions fighting at the same time in Norwich?" brother Ryan said. "Liam's my soul mate. People spend their whole life searching for that and I was born with mine. How lucky was I that when I got to planet Earth my guardian angel was waiting?" Ryan, who has won 19 of his 21 bouts, put Mouneimne on the canvas in round five on Saturday but one judge scored the fight 114-113 to the Brazilian, although the other two had Walsh winning 116-112 and 117-111. "The split decision thing annoys me," added Walsh. "If they'd given me a one-point win I'd be happy, but I believe I won by at least three. The only people who say he won is his team."